If you are looking for information on the Perfect Paint Systems franchise business opportunity, Perfect Paint Systems franchises or Perfect Paint Systems franchising, then you have come to the right place. Success means a lot of things to a lot of people. Big houses. More time with family. Fancy cars. Independence. Two kids through college. The ability to take two weeks vacation in a row - or simply being your own boss. Regardless of what success means to you, Perfect Paint Systems is a great way to get there. Imagine generating $500 to $700 per day in sales, by yourself. It's possible, and being done every day. There are over 225 million cars registered in the United States alone! Most have some type of cosmetic damage - paint chips, bumper scuffs and scratches. That means that there are tens of millions of cars out there ready to repair. Why is so much damage left unrepaired, especially when cars cost so much? Car owners do not want to file insurance claims and have their premiums rise. Collision shops are too expensive, and they can tie up a car for days and days. You can repair these damaged vehicles, in one day, at lower costs and in less time than a collision shop, and without your customer having to file an insurance claim. 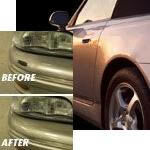 Perfect Paint Systems lets you start making money by repairing paint chips, bumper scuffs and other paint damage. Our paint system lets you match more than 17,000 paint colors. In no time, you will be able to provide car dealers, fleets, rental car companies - even car owners just like you - with money and time saving repairs. Your Perfect Paint System includes virtually everything you will need to begin making money repairing paint damage. Equipment and Paint Package: Includes portable compressor, air brushes, a complete set of paints, a digital scale (for measuring formulas), and all ancillary equipment - enough for hundreds of repairs. Technology Package: Includes a fully loaded handheld computer with a complete database of more than 17,000 paint codes. The handheld goes where you go, so that you have all formulas close at hand. Monthly updates keep your formula database current, even as cars and models change. Training Package: Includes full hands on training at our 10,000 square foot training facility, with professional and experienced instructors. Hand outs include business planning sheets, marketing information, pricing information, how to sell to dealers, and more! You will learn about surface preparation, painting, troubleshooting, using the handheld, etc. We even provide 30 days of startup support at no charge. First and foremost, you will need to provide the desire to start and grow your own successful business. Paint repair services can be provided wherever there is an adequate work area - dealer locations, a garage, etc. You will need a business name and appropriate business registrations, and most paint repair technicians like to house their equipment in a small SUV or van. Start a business, give it a name, get some business cards printed up, and you are ready to start selling!